As a parent I'm a huge fan of Twinkl Resources. Twinkl offers a huge range of educational resources for schools and parents to download, covering just about any theme that you can imagine. Some of the resources are free, and some are available to subscribers only, with packages starting at just £2.50 per month. 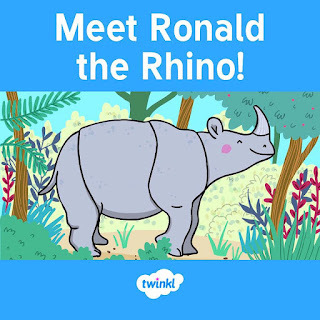 Twinkl have recently published a new eBook - Ronald the Rhino - which is available for subscribers to download and share with their children. It's a Twinkl original rhyming story, and each page features a hand drawn image to illustrate it. The story follows Ronald the Rhino, who isn't happy because he doesn't feel as special as all the other animals that have their own unique trait. He tries to copy the other animals but he still isn't happy, until his animal friends teach him how special he really is. To accompany the story, Twinkl have produced a wide range of resources for children of all ages. The youngest children can retell the story using Ronald the Rhino Sequencing Cards, having fun with the Ronald the Rhino Colouring Pages or practice their scissor skills with Ronald the Rhino Cutting Skills Activity Sheets. Slightly older children will enjoy exploring different words and phrases linked to the characters with these Ronald the Rhino Character Description Activity Sheets, or trying a Ronald the Rhino Count and Graph Activity Sheet. There are also reading comprehension sheets, activity sheets to help children draw the animals themselves and many many more - have a look at all the Ronald the Rhino Themed Resources here. I am a Twinkl Blogger and have received a Platinum Plus subscription in exchange for sharing their resources with my readers.